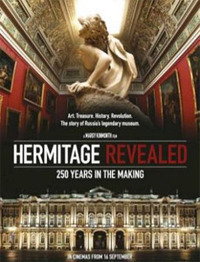 Hermitage Revealed, is a feature-length documentary made in honour of the 250th anniversary of the State Hermitage Museum in St. Petersburg. As such, it doesn't offer any new art historical discoveries, controversies, or insights into the collection or the palace complex itself. What the film does provide is an artful package of entertaining trivia, superlatives supplied by its curators, and reverential footage of some of the Museum's spaces and holdings. The first century and a half this chronology is unremarkable when compared to Russia's turbulent 20th century. Unfortunately, the film's sauntering pace means that when things do get interesting - how the collection and curators survived the Siege of Leningrad (barely), for example, or the Soviet government's attitude to Matisse (disdainful) - so much time has already been spent on showing off masterpieces of Western European art that the Museum's more recent social history feels under-served. The Museum is housed in several of the buildings of the Winter Palace, which like the Louvre in Paris, has been a royal palace, centre of governmental administration, and art museum. There is an emphasis on the Winter Palace's role in Russian history, but the building is presented as autonomous and separate to Russia's changing political landscape. With an 83-minute runtime, it's a suitable length for broadcast. However, I saw it in a nearly sold-out cinema, with an audience predominantly of pensioners, for whom it seemed to function as a travelogue. Hermitage Revealed is the film equivalent of a coffee-table book, full of lush photographs of gorgeous things, but with a frustrating lack of depth. Its treasures are indeed merely displayed, without explanation. The audience is expected to know the names of the great artists, and the relevance of their works, as the film does not offer this to us. However, this seeming lapse is somewhat explained towards the end of the film, as one curator suggests that unmediated accumulation (not discriminating selection) is the collection's strength. For everything, though, the questions posed by this film persist past its run time. Leaving aside the puzzle of the title (what was revealed?) there is an interesting point raised regarding the relationship between ownership of art and national identity. The current curators speak of the sale of paintings in the 1930s by the Soviet government - to the United States's newly-established National Gallery of Art, to purchase farm equipment - is a regrettable betrayal of the cultural heritage of Russia. However, the works in question were purchased by Catherine the Great, having been put up for sale by the heirs of Robert Walpole. This presents a compelling rubric of national identity. A more critical approach would be to pose these questions further, and perhaps, dispense with the breathlessly reverential close-ups of Titians and Rembrandts and Caravaggios. But this is a film to promote the Hermitage Museum, and to hint at the newly-opened Hermitage Amsterdam as a tourist destination, and not to directly challenge the place of a palace full of foreign art in a post-Soviet Russia. The overall tone is so carefully positive, I couldn’t help but wonder how much Kinmonth’s hand was guided by Piotrovsky or others unseen. This review was published on October 26, 2014.